It was something that everyone saw coming. This morning, mainstream media reported that the number of taxis in Singapore have hit an all-time low of 25,699 as of 30 June. This marks an eight-year low, and also a 10.6% drop from its peak of 28,736 in 2014 – a year after Uber and Grab launched here. However, a quick look at the figures have showed a downward trend since then, and with the pervasiveness of the disruptors, it’s difficult to imagine an upward shift from here on. In April, SMRT revealed that they were in talks to sell their taxi arm to Grab, and just yesterday, The Straits Times reported that the percentage of idle taxis hit 9.1% in May – almost twice of the figures at the same time last year. This translates to around 2,400 taxis being unhired. 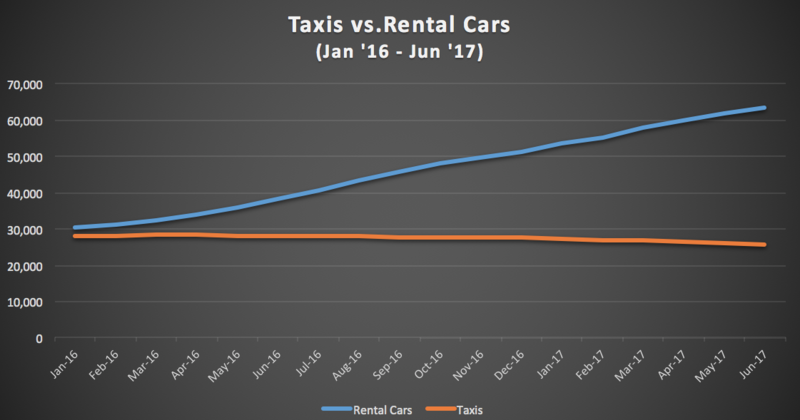 A video taken at the end of last year revealing rows of idle Trans-Cab taxis was already a dire sign that rentals weren’t as robust as they’re meant to be. Transport researcher Lee Der Horng from the National University of Singapore told The Straits Times that the costs of having one idle taxi requires about seven hired ones to cover, and is expecting that the unhired figures would just see an increasing trend. Cabbies are also slowly losing their faith in the business – some hopping over to the private-hire side so clinch the customers that have turned their backs on taxis. We plotted out a graph from its peak in Dec 14 to Jun 17 using figures provided by LTA, and found that the drop had gotten even steeper since the end of last year. Another interesting to note is that the number of rental cars on the road have actually soared rapidly – mainly due to the rise of private-hire services and their drivers. The number of rental cars stood at 63,259 at the end of June, and some 50,000 are estimated to be plying the roads as private-hire vehicles. 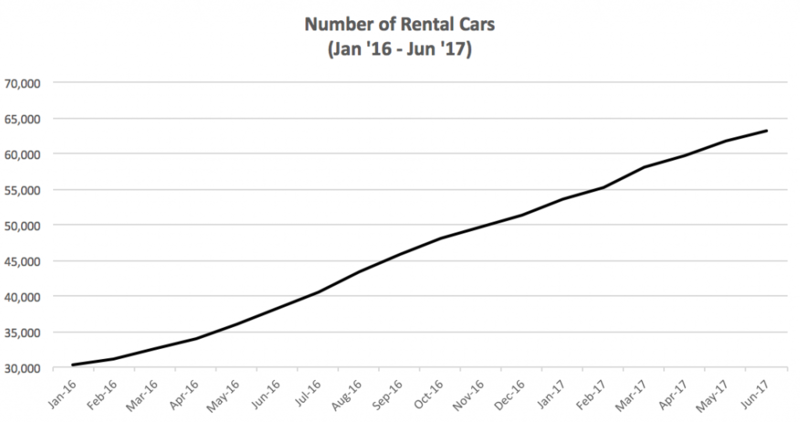 In January last year, these figures were 30,433 – indicating that the number of rental cars have more than doubled in a single year. From my personal experience, I found that a lot of the Uber/Grab rides (especially the latter) that I’ve taken tend to be done in rather sterile vehicles of similar models. Speaking to private-hire drivers, I also found out that a lot took up Uber/Grab-driving as a part-time job to earn back the costs of fuel and rental – using the cars for their personal errands for the rest of the day. In spite of numerous attempts to ‘level the playing field’, and ComfortDelGro recently launching a rewards programme to attract more commuters to take their cabs as a last-mile solution, the figures still seem to suggest that they’re fighting a losing battle. With the flexibility that driving a private-hire vehicle provides, it won’t be surprising if even more Singapore residents take up driving as a side gig.